Coaching, what it is and what it is not? What differentiates coaching as an individual and organizational development intervention from other similar processes has been a subject of debate. Consulting, Counseling, Psychological Therapy, Mentoring and other process interventions such as NLP, TA, Positive Psychology, and Appreciative Inquiry are some of the alternatives that strive to enhance performance of an individual to potential, at the individual and organisational context. Some approaches, as with Consulting may be more organisational interventions, while psychological interventions may be more individual. Coaching too has been viewed more as an individual behavioural intervention till recently. It is only now that systemic coaching as an organisational development approach is gaining the attention it deserves. I view these interventional differences in a matrix of time and communication. Some of these interventions are future based and some are past based. Some of these interventions use the asking exploratory approach and some use the directive telling approach. There is no right or wrong. Each intervention may work better in a situational context. In addition, one can bring in the organisational and individual context as the third matrix. If you need a fourth, you can bring in the elements of experience and expertise in the realm of communication. What would be common in all cases would be that the client, as an individual or organization, desires an outcome that requires some challenges to be overcome, either internal or external or both. This is a reasonably simple one. Consulting someone, mostly organizationally, requires that the Consultant provider has the experience and expertise in the challenge faced by the client. Both consulting and coaching are future focused. Consulting is a direct solution based approach whereas coaching is an exploratory awareness creation approach. Generally consulting would yield faster results though these may not sustain of awareness of the need for the suggested solution is not acted and anchored. There are however coaching based consulting approaches as suggested by Ed Schein and others that adopt a more partnered consulting approach. Many of the psychological behavioural interventions are based on uncovering past conditioned experiences to help client overcome traumas arising out of them. Different therapies follow different processes. All are focused on the past, and to some extent based on the directive telling approach. Carl Rogers attempted to change this to a client centric explorative approach resulting in counseling as an intervention. 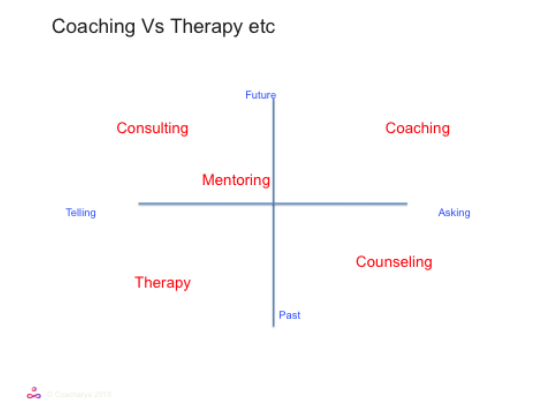 Coaching is far more a future based asking approach and coaches are generally warned not to follow therapeutic approaches even if they are qualified without explicit client permission. Counseling is much closer to coaching than other psychological therapeutic interventions. It is more focused on listening and asking. However, its focus is still more on helping client overcome past experiences, especially ones dealing with emotional traumas. Many subjects that traditionally were the counselors’ space of expertise such as relationship, grief and loss are now capably handled by coaches using outcome oriented approaches. Much has been made of mentoring being highly different from coaching and even out of ethical bounds of coaching. This is just not true. European Mentoring and Coaching Council (EMCC) recognizes mentoring as an integral part of coaching as long as mentoring is not confused with solution provision. If coaches are honest with themselves all coaching has an element of advice and suggestion. No coach is so totally non-judgmental that personal emotions and cognition arising out of these emotions are not expressed in some form as partnering and sharing with client. In fact at the mastery level coach’s ability to authentically convey intuitive emotional and somatic responses to the client with the vulnerability to accept disagreement would be considered essential to partnering. Many corporate executives are more comfortable with a coach who has walked the talk with experience and expertise to also mentor them within a coaching framework. They are not looking for theorists but practitioners who can help them find a solution. Most coaches do wear the mentor’s hat on occasions. However, it is critical to remember that sustainable results can only happen if client discovers own solution through own awareness. Creating that awareness is the coaching framework. Coach needs to be self aware of this boundary. Use this framework to differentiate coaching from similar approaches to help clients enhance performance to potential. Ram is the Founder and a Principal at Coacharya. As the resident Master and mentor coach, Ram oversees and conducts all aspects of coaching and training services offered under the Coacharya banner.